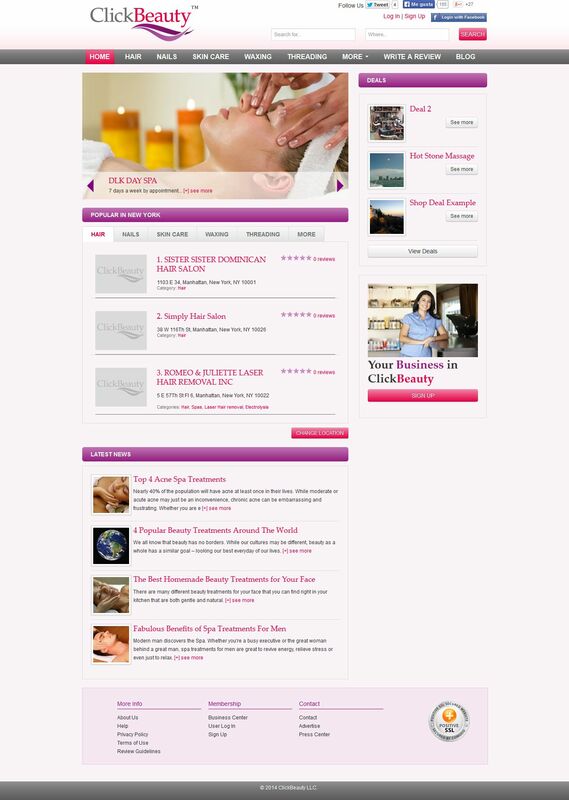 ClickBeauty is the ultimate resource for the beauty consumer. The site connects people with a wide variety of beauty businesses, from hair salons to cosmetic stores, in their local area. We have provided full assistance to the client during the whole development phase. We were in charge of its design, development, testing, mobile site, and SEO. This projects was a major experience in our company for all the things we've learned during the process. We have enjoyed building its custom made system for appointment bookings and a full commercial integration with Authorize payment gateway. Business account to manage their business page after registration: Businesses are able to add general information as well as services (beauty businesses) or products (shops). Services: Services allow visitors to request appointment through the site using a Booking package built on Cobalt with custom features. Bookings: Visitors request appopintments from a list of services already added by businesses. Business confirms or suggest 2 alternatives. Both businesses and visitors have their own calendar. Every single action triggers a notification mail. These mails are not just informative but contain encrypted links to confirm, suggest or cancel the appointment with one click. Integration of Cobalt & Emerald with Authorize CIM: CIM stands for Customer Integration Management and it's a special feature provided by Authorize which lets you handle customer information to allow recurrent charges. We needed this because business pay a fee on confirmed appointments. Businesses and users manages their credit card information using our integration with Authorize CIM (everything is done through our site, though the client never gets out of it). Deals section: Businesses are able to add their deals for a limited time. Payments are done directly to ClickBeauty through PayPal and Authorize CIM. ClickBeauty pays back to businesses once per month using our custom reports built on Cobalt. Highlight your business for 10 days: Business can mark their business as featured if they pay a fee. Spotlight your business: Business pay to be listed on the Spotlight section, which is a way to get more hits into their listings. Reviews: Visitors can add reviews to businesses. The difference with native Cobalt features is that we allow public users to add their reviews, then we force them to login and after login we redirect users to the previously review form with all the information that was previously added by the user (user doesn't have to re-complete the form at this time). At last, this was a case of study to test Cobalt performance because this site contained 300K records bought by a 3rd party (we design and build the process to export and import this information into Cobalt tables). At first we had several issues, but we were finally able to get extraordinary results with Sergey's help.